The Earth was a very different place 3.5 billion years ago. In the absence of oxygen, many scientists believe Earth's earliest ecosystems survived on sulphur, but researchers have long been unable to find any proof of this hypothesis, in the form of fossilized microbial life. 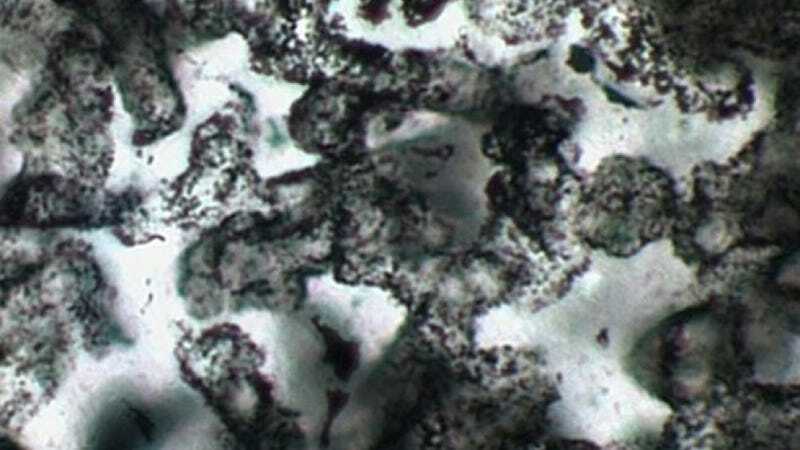 Now, an international team of geologists has discovered evidence of 3.4-billion-year-old single-cell organisms, making them the oldest known fossils on Earth. And all signs point to them being sulphur-munching little buggers. These so called "microfossils" were discovered in a slab of sandstone at Strelley Pool in Western Australia, a region researchers say was likely one of the first known stretches of beach on a much younger Earth — one with environmental conditions very different from the ones we know today. In the absence of oxygen-providing plant life, the Earth's atmosphere was thick with methane; the oceans steamed with heat; and the moon, orbiting much closer to our planet than it does today, caused the sea's tides to swell and decline in dramatic fashion. "To us it would have seemed like a hellish place to live," said Oxford University's Martin Brasier, who collaborated with University of Western Australia's David Wacey on the research. But to early life, continues Brasier, "this was paradise. A true Eden." The researchers suspect that the organisms they've identified were some fo the planet's earliest beach bums, living between grains of sand on the Earth's earliest land masses. By carefully analyzing thin slices of rock containing the fossils, like the one pictured up top, the researchers have concluded that many of these early organisms likely survived in Earth's oxygen-free environment by feeding off sulphur-rich compounds known as detrital pyrite (you probably know pyrite by its more common name of fool's gold), producing sulphate and hydrogen sulphide as waste products. Their conclusions are supported by the fossilized organisms' various cellular structures, which the researchers found clustered together in close association with the micrometer-sized pyrite. This finding is one the researchers claim to be very important given the fact that little-to-no evidence of sulphur-metabolizing bacteria exists to support the widely-held hypothesis that earth's earliest ecosystems were, in fact, sustained by sulphur. The new evidence from our research points to earliest life being sulphur-based, living off and metabolising compounds containing sulphur rather than oxygen for energy and growth...It is vital to know what the most simple life on our planet looked like, and how to unambiguously identify it, if we are to have any chance of identifying life elsewhere.